What could be nicer and more relaxing than a massage? Massage is an amazing therapy that reduces pain, induces relaxation, and takes your stress levels down a few notches. However, not all of us have the funds to run out and get a massage every time we need one. What can you do in place of a massage to improve your blood flow, reduce stress, and alleviate your aches and pains? A full-body massage mat, complete with heat and vibrating action is an affordable way to enjoy the benefits of an on-demand full-body massage in the comfort of your home. The good news is that we have done the research for you, so you can make a wise choice in the massage mat just for you. We have found three high-quality, durable, and affordable vibrating massage, heat mats for you to consider. This full body massage mat is under $60 and comes with heat and 10-motor massage to cover your body from your neck to your calves and provides heat for the lumbar (lower back) region of your spine. This massage mat is firm, comfortable, and is suitable for use on the floor, recliner, or your sofa. It’s pliable, lightweight, and foldable to easily conform to almost anywhere you want to use it. The cover is also comfortable and provides that little extra bit of foam for softness. The user-friendly LED remote control panel allows you to select where you want the massage. There are four zones from which to choose, so you can choose the full-body treatment or focus on an area that needs it the most. You can also adjust the intensity level from one to three, depending on what you need to achieve relaxation. The auto shut-off timer allows you to enjoy worry-free massage and heat for 15, 30, or 60 minutes. Bonus Tip 1: If you want a little extra pain-relief boost, we recommend Amazon’s choice Thermachill roll-on natural pain relief. You can apply this to areas that hurt the most to further enjoy pain relief along with your massage mat. Bonus Tip 2: If you like a removable cover to wash, one of the Relaxzen massage mats offers that option as well for under $70. This is recommended if you choose a light color. The Belmint full body massage mat is similar to the Relaxzen mat, except it weighs a bit more (5 pounds instead of 4.5 pounds) and it offers fewer shut-off options. In fact, they are so similar we think they might be manufactured in the same factory. Nevertheless, here’s the scoop on the Belmint massage and heat mat. It offers 10 massage motors, heat option only in the lumbar region, and the same basic massage zones, intensity settings, and massage modes for targeting specific areas. It is also foldable for storage and pliable and lightweight enough to use on the floor, a recliner, or the sofa. Notice the aspects of the mat are similar to the Relaxzen. 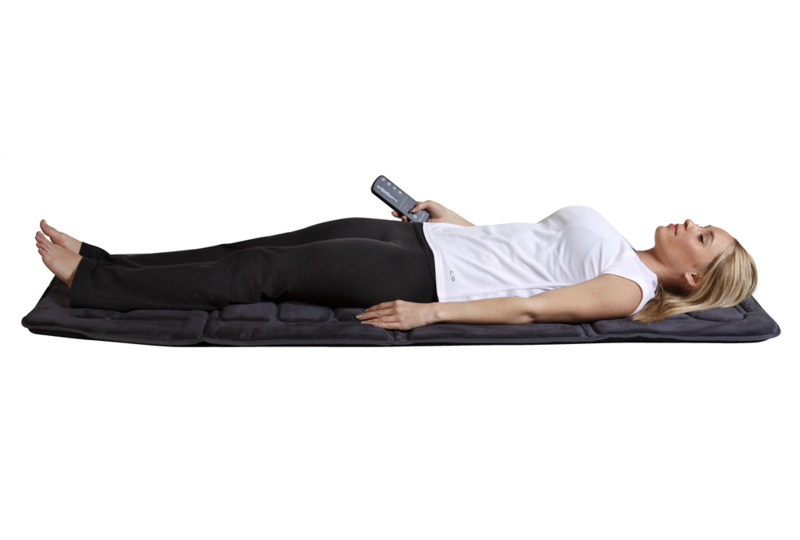 The Belmint full body massage mat comes in black or beige. This Soozier 10-motor massage mat provides a stronger massage (on the high-intensity setting) than either the Relaxzen or Belmint mats. The Soozier features 24 back magnets and 10 rejuvenating massage heads to aid in the distribution of full-body pain relief and to alleviate tightness and soreness in the muscles. Besides vibrating massage, the Soozier offers pulsing massage. It doesn’t have the function to select a specific region of the back for heat or massage. It is only used in full-body mode. It is lightweight and foldable for easy storage and can also be used on the floor, a sofa, a recliner, or other surfaces like the Belmint and Relaxzen mats. Notice the slight differences between this full-body massage and heat mat and the Belmint and Relaxzen models. The biggest is the lack of control zones. Consequently, it makes up for that with the range of massage style settings like rolling massage, pulse, and vibration. The Relaxzen electric full body massage mat gets our recommendation for the best of the three mats from these reviews. Why? Because this mat is well-made, comfortable, adjustable, and is suitable for any kind of surface. Additionally, this company is well-known for its superior customer service and support. The reason the Soozier didn’t make it as our top recommendation is that it doesn’t have the feature for choosing specific areas to massage. But, we did like it for its range of massage styles and the 24 back magnets. These three heat and massage mats are designed to cover the whole body (unless you are very tall) and effectively provide relief from muscle and nerve pain, cramps, joint pain, and will reduce your stress levels. Choosing a full body massage and heat mat is a personal choice, so each person will have their own preferences in features and construction. Our recommendation is based on customer reviews and research about the companies. That being said, every brand we reviewed here is a reputable brand and provides high-quality products. That sounds like something my mother could use. Do these massage mats help with back pain as well? My mother spends all day on her feet and her back and joints usually get sore by the end of the day. It would be nice if this thing wasn’t just for relaxation.